You knew it was coming… Guardians Team-Up! This February, two legendary creators unite for the out-of-this-world GUARDIANS TEAM-UP #1! Launching directly out of the blockbuster Guardians of the Galaxy series comes a brand new ongoing series bringing the breakout characters of the year to the Marvel Universe’s grandest stage for bombastic adventures with Marvel’s heaviest hitters! Kicking off with a cosmic threat so massive, it’ll take more than just the Guardians of the Galaxy to stop it! Assembled shoulder-to-shoulder with Earth’s Mightiest Heroes, the Avengers, prepare for these two titanic teams to unite like you’ve never seen before. What do you get when you combine the likes of Rocket Raccoon, Gamora, Black Widow and Hawkeye? Total destruction! Yet as tensions run high, can these two teams put aside their difference and work together for the greater good? 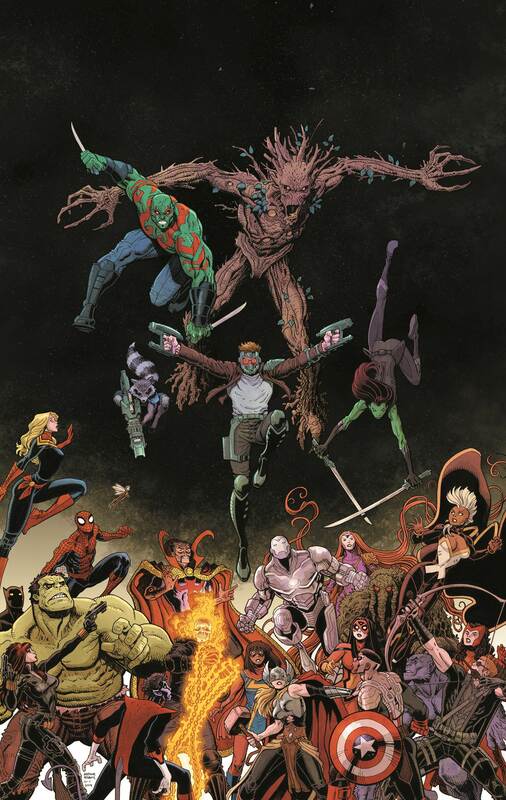 Get ready for some of the most epic team-ups you’ve ever seen as each Guardians Team-Up story new team-ups from a rotating crew of Marvel’s top-flight talent and a surprising array of Marvel Universe cameos that will have fans clamoring! What happens when Rocket Raccoon meets Deadpool? What about a mean & green throwdown as Gamora and She-Hulk take care of business? How about a team-up with the Children of the Atom as part ofthe upcoming Guardians of the Galaxy & X-Men: The Black Vortex cosmic event? GUARDIANS TEAM-UP has all that, and more to come! Be there when the explosive creative team of Brian Michael Bendis & Art Adams blast off into the stratosphere as the Guardians of the Galaxy come to rest of the Marvel Universe like never before! Strap in for an adrenaline-fueled thrill ride when GUARDIANS TEAM-UP #1 explodes into comic shops and digital devices this February!